How can we use agricultural and food-processing waste to create useful products for a sustainable Europe? Around one third of all food produced each year is wasted and around half of this waste arises at the field and food processing levels. In Europe alone, around 90 million tonnes of food and 700 million tonnes of crop are wasted every year. Part of the solution lies in projects such as Agrimax. This four-year, EU-funded project involves 29 partners across 11 European Countries and is developing and demonstrating the production of multiple, high value products from crop and food processing waste. The project is also developing economically competitive routes to the commercialisation of these products, using flexible, and possibly cooperatively run, processing facilities. The aim is to maximise the EU’s sustainability, while providing new biobased compounds for the chemicals, food-packaging and agricultural sectors. 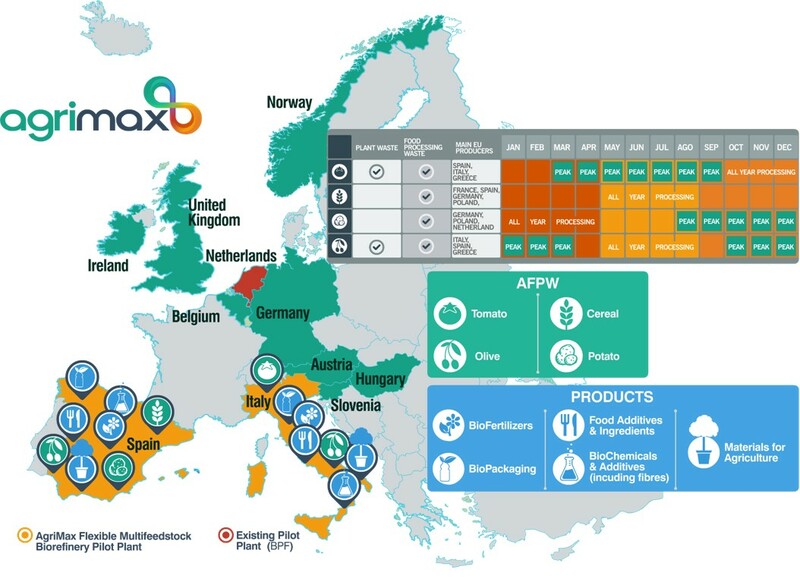 Agrimax will take the residues and the by-products from tomatoes and cereals in Italy and process them in a new, flexible, multi-feedstock pilot biorefinery which is being built by the project. Another new pilot plant in Spain will do the same for olive and potato waste. The pilot plants are now in the final specification and pre-construction phase and are scheduled to be operational by the end of 2018. Their target is to convert 40% of the waste they receive into high-value material. An online platform to coordinate the provision of this waste will help maximise the use of these pilot plants throughout the year. The by-products and residues will be broken down, first using ultrasound and heat, and then using enzymes and chemical reactions. From this process, a cascade of high-value products will be extracted. For the food industry this will include: anti-oxidants to improve food properties; and cellulose fibres to add texture to soups and juices. For the farming sector, products will include biodegradable mulching films and pots in addition to biofertilizers. For the packaging sectors new biobased solutions will be developed to improve the properties of the materials and extend the shelf life of the products. To validate these innovative biobased products they will be tested by end users. Any remaining biomass will be used for biogas or returned to the land for soil enrichment. Importantly, the project will also assess the environmental, social and economic sustainability of this approach. Life cycle analysis will be used to assess the total environmental impact of the new production pathways. The effect of the new farming practices and new fertilisers on soil health will also be assessed. Last autumn, the project held a workshop which attracted over 70 stakeholders from across Europe. These stakeholders included farmers and food manufacturers from the olive, tomato, potato and cereal processors industries as well as potential end-users of Agrimax products. The insights from this workshop has provided essential information into the sustainable supply chains that Agrimax seeks to create, identifying critical stakeholder issues such as contextual constraints and drivers that must be addressed in the development of effective circular business models. These insights will be important in developing economically viable routes to commercialisation of the Agrimax processes. Reduce waste and our dependence on fossil-fuels, Agrimax will help to maximise the EU’s sustainability, while creating new growth and jobs. For futher information, visit Agrimax Website, with publicly available resources (including a short animation to easily explain the aims of the project). This project has received funding from the Bio Based Industries Joint Undertaking under the European Union’s Horizon 2020 research and innovation programme under grant agreement No 720719. This article was provided by Emma Needham, Agrimax Communications Manager, BioVale.